Distribution of clusters around the LMC and the SMC from Bica et al. (2008) and Pieres et al. (2016). 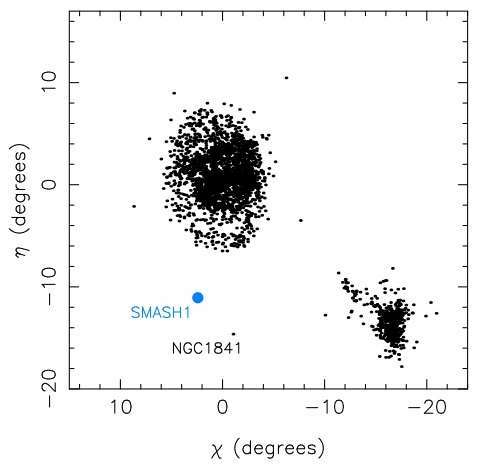 SMASH 1 is represented by the large blue dot, at a distance from the LMC where only a few clusters are known, including the old and metal-poor NGC 1841. Credit: Martin et al., 2016. An international team of astronomers, led by Nicolas Martin of the Observatory of Strasbourg in France, has detected a new, very faint stellar system, designated SMASH 1. This compact, very faint system could be a satellite of the Large Magellanic Cloud (LMC). The findings are reported in a paper published Sept. 19 on arXiv.org. In the continuous search for satellite systems of the Magellanic Clouds, the Survey of the Magellanic Stellar History (SMASH) has proved to be invaluable when it comes to finding very faint LMC-bound stellar systems. The survey investigates the complex stellar structures of the Magellanic system—the clouds themselves, the Magellanic Bridge and the leading part of the Magellanic Stream. The project employs the Dark Energy Camera (DECam) mounted on the 4 m Víctor M. Blanco Telescope at the Cerro Tololo Inter-American Observatory (CTIO) in Chile. Martin’s team found the new stellar system in the outskirts of the LMC while conducting a single field observation in January 2014 under the SMASH program. The system was discovered through a visual inspection of the stellar distribution of stars that could correspond to red giant branch or main sequence stars. However, Martin admitted that discovering such a faint system is not an easy task. “It isn’t trivial to find such a faint stellar system. To discover SMASH 1, it is necessary to remove the contamination of much more numerous foreground stars by selecting only stars with the right color and magnitude. After this step, it’s still necessary to use statistical tools to find the small but significant overdensity of stars that SMASH 1 represents. We have been developing these tools for a few years, now, so it was only a matter of updating them and applying them to the SMASH data to discover SMASH 1,” he told Phys.org. According to the paper, the SMASH 1 is very faint, with a luminosity of about 200 times the sun’s luminosity and is compact, with a radius of approximately 29 light years. The system is located about 186,000 light years from the Earth and 42,000 light years away from the LMC. The researchers also revealed that it is an old (about 13 billion years) and metal-poor stellar system. The team assumes that SMASH 1 could be a satellite cluster of the LMC due to its exceptional properties. The system appears to be under the tidal influence of the LMC that could be currently shredding it. However, a measure of the systemic velocity of SMASH 1 is necessary to confirm its association to the cloud. “It is very likely because its distance from us and position on the sky places it in the sphere of influence of the LMC. But it’s also possible that its velocity means its orbit is not bound to the LMC. Only follow-up observations would unambiguously confirm the association,” Martin said. But although the astronomers have a good idea of the system’s distance, size and luminosity, they are missing some crucial information on its kinematics. “Only follow-up spectroscopy would tell us what it’s velocity is with respect to the LMC, for instance,” Martin concluded.